Is your wedding on the cards? Are you a die-hard Bollywood fan? If yes, why don’t you combine both for a beautiful destination wedding- Bollywood style! Trust Bollywood to add its very own desi tadka when it comes to weddings! Bollywood’s love for groovy songs, crazy dance moves, gleaming outfits and of course mesmerizing locations makes it the perfect recipe of every dream wedding girl could ask for! Here’s taking a look at the top destination wedding venues that Bollywood has popularized over the last few years. Go ahead, look and share with your Bae! We are starting off with the very best! Who doesn’t remember KalkiKoechlin’s gorgeous wedding in the movie? The films revolves around aspiring Wedding planners, it was full of beautiful wedding scenes and songs. However, the one venue stood out in the movie was the Royal Lalgarh Palace. A famous ancient Royal palace that held the props for the song ‘DUM DUM MAST HAIN’! If you’ve always wanted to get married in a beautiful palace, the Lalgarh palace in Bikaner is where you should head to! If you have an extravagant budget and you’re looking for an International wedding destination, a la shaandaar- Leeds in the UK is just perfect! It is a very exotic location with stunning architecture; it will also make your wedding a Royal affair! Kareena Kapoor in the movie was all set to marry a ‘Price Tag’ when madhavan and Sharman Joshi whisked her away in a car at the last minute! The wedding scene was shot at the beautiful Woodville Palace Hotel (Shimla) a renowned palace, with its eye catching mountain beauty that has become an exquisite spot for Destination weddings for Indians as well as NRIs. Wan a stunning Royal wedding? 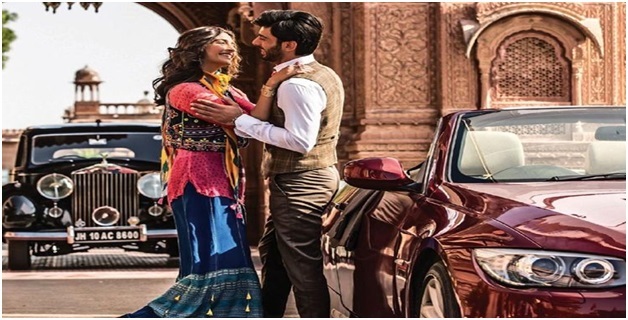 Go, and get hitched at the Marvelous Lakshmi Niwas Palace in Bikaner, Rajasthan that is so beautifully captured in Sonam Kapoor starrer Khoobsurat! This Bikaner masterpiece is designed with exquisite interiors. There is no better way to indulge in the Royal wedding experience than choosing this Royal palace for your venue! Apar from these crazy wedding venues do check out Wedding Venue booking at Zuri White Sands Goa. We all love Bollywood films and undoubtedly, we fall in love with their grand weddings! So, what are you waiting for? Go, talk to your bae and get ready for your own Lights, camera and action!